We hear a lot of noise about Bitcoin and Ethereum in the news and want to be involved but don’t necessarily know how. MyVested makes it easy to buy cryptocurrency using spare change. Customers can ‘dip their toes’ into the cryptocurrency market without having to get their hands dirty. 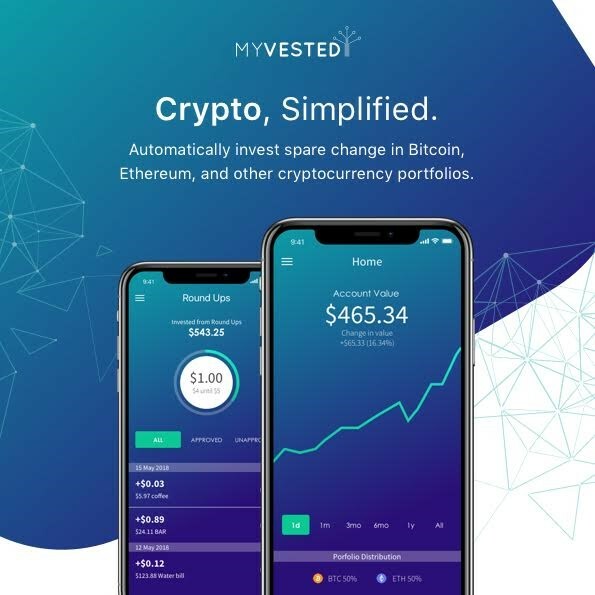 With the potential for cryptocurrency to become mainstream, MyVested will be well placed to provide new innovations around cryptocurrency portfolios and funds. The New York times stated last week that “Andreessen Horowitz, the well-known firm that made early bets on Instagram and Reddit, said on Monday that it was creating a $300 million fund focused exclusively on projects inspired by the original virtual currency, Bitcoin.” Cryptocurrency is moving beyond the validation stage, and major institutions are now starting to open funds with long-term investment horizons including cryptocurrency. The MyVested application makes it easy for customers to buy, sell and store cryptocurrency. It encourages customers to invest more money by setting savings goals and then helping them reach those goals by using retailer discounts and spare change. Investors can setup a MyVested account that accesses their online bank details using the Basiq Open Banking platform. Every time a customer makes a purchase, the MyVested application uses the Basiq Open Banking platform to check the transaction in the customers bank account. Spare change from the transaction is automatically invested in cryptocurrency. Plus, discounts are given by retailers based on the amount spent with them. Over a longer period of time, these micro-investments create a larger savings portfolio with little impact on the day-to-day budget. This is termed ‘round-up investing’, which a number of Australian fintechs are taking advantage of. Basiq’s Open Banking platform has a powerful categorisation engine which enables fintechs like MyVested to build round-up apps tailored to an individual’s spending behaviour. Basiq also provides a UI Control which fintechs seamlessly embed within their app to enable customers to securely access online bank data. This means fintechs can be up and running and accessing financial data within an afternoon. The MyVested web application will be launched to the public soon and will enable everyone to easily invest in cryptocurrency.